This summer, the Internet warmly embraced the birth of “Monkey Jesus,” a tragicomic attempt by a well-intentioned octogenarian in Spain to restore a decaying fresco by herself. But the ape-ified “restoration” wasn’t just a source of countless online memes; it was a grim symptom of a crisis metastasizing across Europe. Struggling under unpaid debts and forced into austerity, governments in countries like Spain, Greece, and Italy are slashing their culture budgets in search of potential savings. But the question remains: if Europe’s going to prioritize cultural upkeep, who's going to pay for it? Generally, the EU wants national governments to pony up. (“The upkeep, protection, conservation, and renovation of cultural heritage are primarily a national responsibility,” said EU culture ministry spokesman Dennis Abbott, adding that it is the individual states’ job “to invest in the upkeep of our cultural heritage” to maintain the tourism industry. ) But taxpayers in debt-laden countries don't seem terribly sympathetic to that notion—which should perhaps come as no surprise given the anxiety over more basic cuts to the welfare state. That leaves the private sector. A report commissioned by the EU recommends that individual museums and sites make “a transition from institutionalization to community-based services” by reaching out to private and international actors for financial help. And, increasingly, that’s exactly what cultural institutions across the continent have been doing. Meanwhile in Spain, Seville’s Old Town, a beloved UNESCO World Heritage site, is putting up a 40-story banking tower in the town center; the mayor has promised to funnel the millions of tax revenue to upkeep and restoration. And Diego Della Valle, of the international shoe giant Tod’s, has pledged €25 million to the renovation of the Colosseum, in exchange for exclusive rights to use the image of the building. Unsurprisingly, there have been plenty of skeptics, mostly from the art world. The monument rental plan has Greek archeologists up in arms, calling it “sacrilege.” UNESCO has threatened to declassify Seville’s Old Town as a World Heritage Site, and outrage about selling the image of the Colosseum has led to a lawsuit, temporarily delaying renovation plans. But the local politicians and culture directors who struck these deals are continuing to operate under the “desperate times call for desperate measures” maxim. Della Valle’s contribution to fixing the Colosseum has brought an end to “a nightmare and an obsession, that the most famous monument in the world is not in a condition equal to its importance,” said Rome mayor Gianni Elemanno, who solicited multiple private donors when government funds ran dry. But the precedent Alemanno cited in defending the renovation was less auspicious than he likely intended. 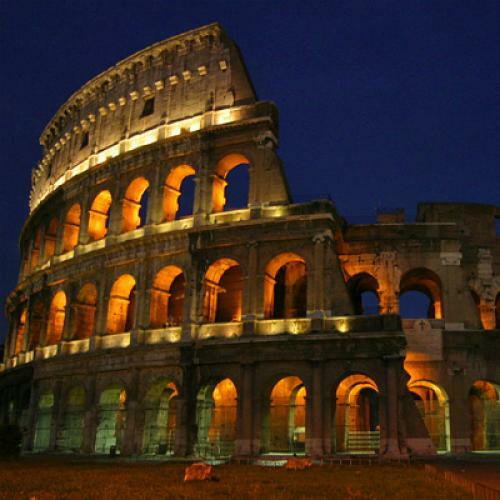 The last person who funded such a fundamental overhaul of the Colosseum, he says, was Benito Mussolini.